ELIZABETH CITY, NC - Earlier this year, Dodge released the all new Challenger Hellcat and the Charger Hellcat to the delight of a patiently waiting public. The Challengers can partially thank their popularity to the Furious 7 film, which is one of the highest grossing films in history, grossing $1.3 billion since its release in April. Now, drivers can be more like their favorite Fast and Furious stars since Dodge unleashed a hemi-powered Challenger Drag Pak to the masses! The Dodge Challenger Drag Pak is a race-prepped version of Dodge's two-door muscle car that is built specifically for drag racing. Let the burnouts begin! 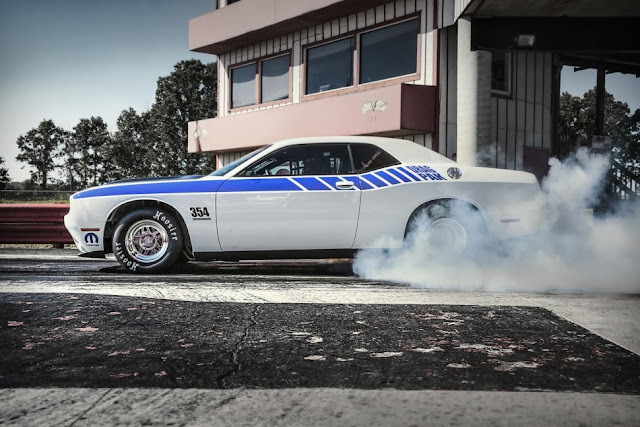 The Challenger is a vehicle that is steeped in racing history and lore. The dominating muscle cars of the 1960s and 19702 made their reputations not just with an unmatched power and timeless styling, but also with dominance on the track. Now the Challenger is back to claim its top-spot and seek glory in the racing world. Racers can choose between two different V8 Hemi engines. The 354-cubic-inch supercharged V8 features the same displacement as the first production HEMI, whereas the naturally aspirated 426-ci version recalls the now-classic motor used in numerous Chrysler Corporation race and road vehicles from the '60s. Both of the engines are powered by a racing-tuned automatic transmission, and the Drag Pak includes multiple chassis upgrades such as bulked up suspension and brakes, 15-inch lightweight wheels and Hoosier drag radials.